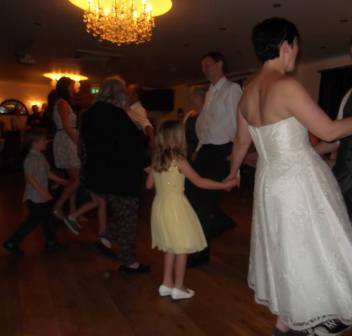 A barn dance or ceilidh is ideal for a family occasion, such as a wedding or birthday party. It is great fun for all the family. A village dance is the perfect way to bring members of the local community together. A dance is also a great way to raise money for a good cause, for a company party, or a fun way to finish off the day at a business conference. If you are planning just such an event please get in touch using the details on our contact page. So what is the difference between a barn dance and a ceilidh? The answer is very, little really. The term 'ceili' was originally an Irish word simply meaning a gathering of people. Similarly, in Scotland a ceilidh is a party. The term 'English Ceilidh' was coined in the 1970s by young folk dancers wanting to distinguish their form of lively dancing from the more staid form of dance found in the clubs. 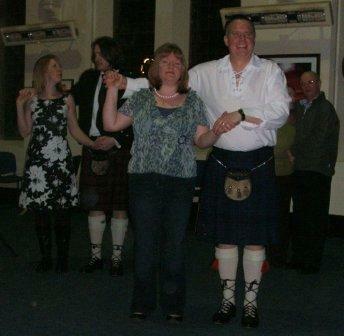 Nowadays most UK folk festivals will include a ceilidh, and you will see dancers of all ages and abilities. The dances are deliberately kept simple, to allow newcomers to take part without any prior knowledge of the dances, and to allow room for freedom of expression in terms of style, stepping, flourishes, etc... There is always a dance caller, who will choose the dances, will walk them through, and call the figures during the dance. At a scottish ceilidh by comparison, there is traditionally no dance caller, people would have been expected to know the dances. Nowadays, callers are sometimes used in Scotland too, although most scots will have learned dancing at school, and many attend regular dance classes, or attend a number of dances every year. The term "barn dance" has been used in England for hundreds of years to describe an event involving country dancing. No one seems to know why this has nowadays become associated with the American Wild West. If you advertise an event as a barn dance or a hoe down, chances are you'll get people turning up dressed in checked shirts and cowboy hats. Barns are generally not the best of places to hold a dance these days, they tend to be dirty, dusty and draughty places. The local village hall, scout hut or church hall will have been designed specifically for dancing, and so is generally a much better bet. Having said that, a number of farms have had their barns converted, and there are some great venues available if you want to go with the wild west barn dance theme. 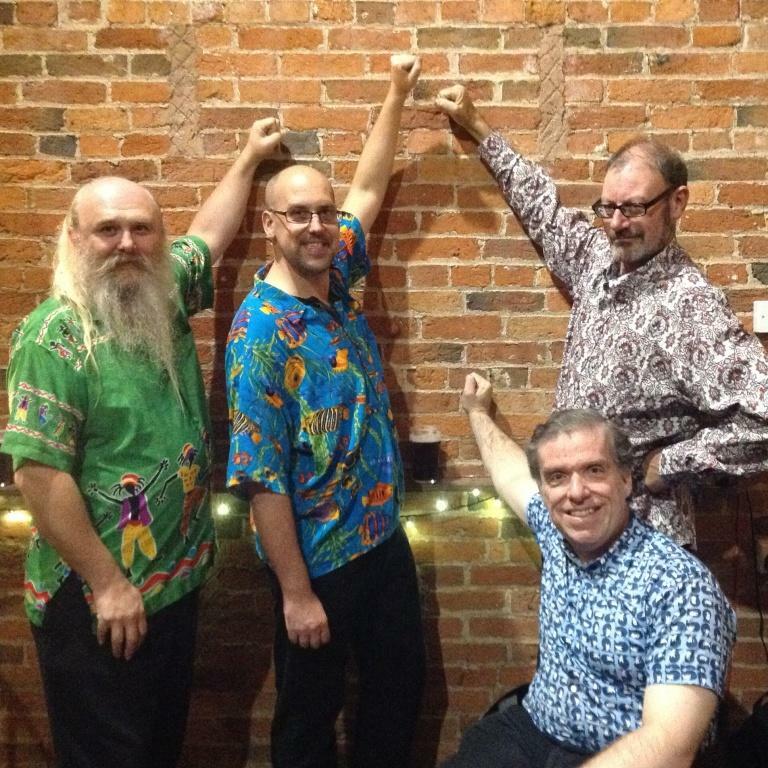 The Bang On The Wall Band are primarily an English band, and therefore our repertoire is mostly English traditional tunes. We also have a good selection of Scottish, Irish and American, as well as some European and modern compositions. If you are looking for a traditional Scottish ceilidh dance, please do let us know, so that we can ensure the caller is prepared. Generally if there are likely to be English people at the dance, we would still recommend using a dance caller, and would usually suggest a mixture of English and Scottish dances, so that people who don't know the dances aren't left out. 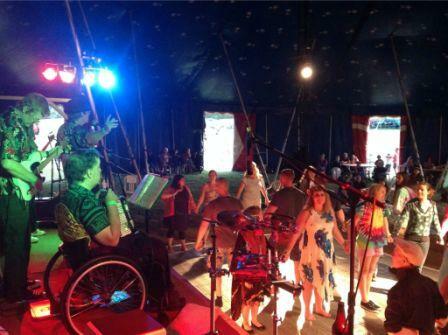 Whether you like to call it a barn dance, a ceilidh, or whatever, The Bang On The Wall Band, like to play lively music for people to have great fun dancing to.